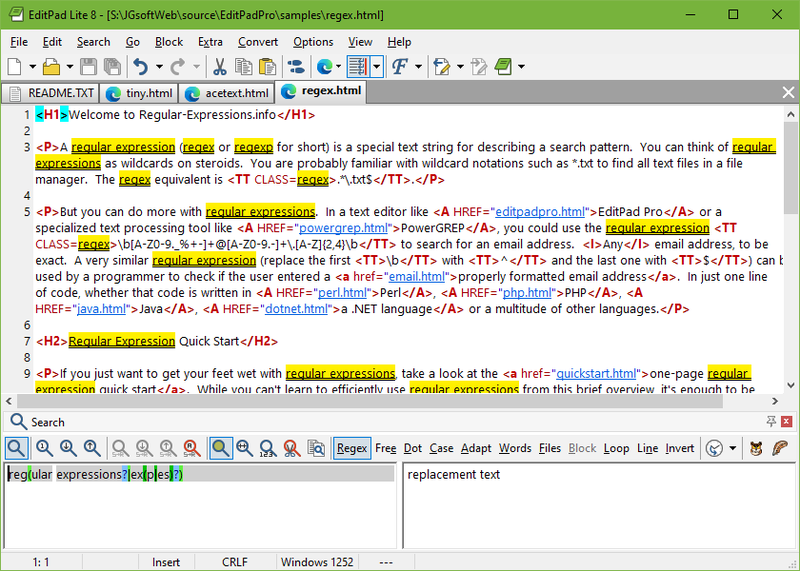 I need a simple/small text editor with FindAll & Highlight . it highlights all Find Hits . I would like a simple/small text editor that does the same 'highlight all hits'. Ever heard of EditPadLite ? without opening the search pane or altering the search term in the search pane. You can configure EditPad Lite to do this when you double-click a word. Options->Preferences->Search-> tick box: "Double clicking a word instantly highlight all its occurences"
Some work out-of-the-box by double-clicking the word to select all occurrences. With others you need to use search-->highlight all matches either from the menu or from a search dialog. Last edited by TP109 on Sun Mar 12, 2017 6:05 pm, edited 2 times in total. vmars316 wrote: Thanks Folks ! What's a good program to remove all its entries ? File-> Delete Selected Keys/Values...OK ? Orca wrote: I've had a quick bash at trying to portalize Editor2 with yaP and I believe it largely eliminates the registry-entry problem. Thanks for building your Editor2.zip yaP launcher. Apparently, yaP *.exe ad-hoc launchers invariably return a VT 16/59 score. I observed the very same score for a recently tested ExifPilot launcher, with no apparent ill effect. TP109 wrote: What's a good program to remove all its entries ? If you run Orca's yaP launcher, that should remove those registry entries when you close Editor2 and those registry entries will be saved to a settings.reg file in the yaP launcher folder. On my machine, Editor2 creates 90 registry entries in HKCU\Software\ZabaraKatranemia Plc\Editor2. Below are the before and after screenshots before running Editor2 with Orca's modified yaP launcher (with changes above) and after closing it. If you run Orca's launcher, the entire contents of the ZabaraKatranemia Plc subkey will be removed from the registry and saved to the Editor2 yaP launcher settings.reg file, including any entries for other applications by the same developer if they exist. That shouldn't do any harm, but that means copying and removing extra subkeys, and if another of the developer's apps exist, those settings will be written or overwritten each time either Editor2 or the other app(s) are started and closed. That could make for a confusing situation. Last edited by TP109 on Thu Mar 16, 2017 4:01 am, edited 2 times in total. The suggested code enhancement to Orca's yaP launcher illustrates nicely the synergy alive across independent TPFC fellow hackers. Just tested it with an ed2.ini file and it didn't work. Maybe other settings within the ini file are required? I tested it using ver 2.5.0.5 of Editor2. I tested using an ed2.ini file with ver 2.9.1.13 Ansi and it saves the settings to the ini file. So it looks like that will work depending on the version. TP109 wrote: So it looks like that will work depending on the version. Editor2 native portability is a relatively recent enhancement -- from my files it is present since v2.9.1.6, but I can't guarantee it was when it appeared* (or even if it works...). Further portability info from the developer can be read at http://zabkat.com/x2h_9.htm#sap_bri. *) it was already present back in 2013, as I posted about at http://www.portablefreeware.com/forums/ ... 002#p63002. Last edited by Midas on Tue Mar 14, 2017 1:07 pm, edited 1 time in total.